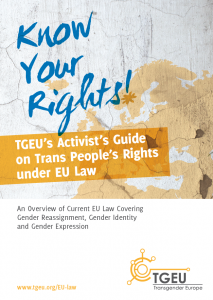 TGEU’s two guides on EU law provide an overview and summary of EU law that is relevant for trans people living, working, visiting or claiming asylum in the EU. 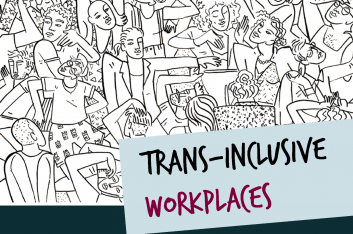 TGEU’s Activist’s Guide summarises the legal provisions in EU law that protect trans people from discrimination in the areas of employment and goods & services, as well as the rights of trans victims of crime and trans asylum seekers and refugees. The 20 page booklet contains references to specific legal cases and legal texts and paragraphs, thus making it a useful tool for activists to use in their advocacy work. The Activist’s Guide is the more technical and legal publication of the two guides. 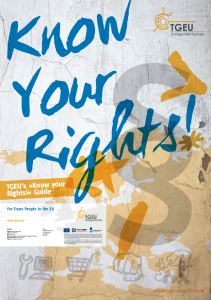 TGEU’s “Know your Rights!” Guide provides an overview over the same areas of EU law as the Activist’s Guide, but it is shorter and written in more accessible, less technical language. The guide aims to raise knowledge and awareness about trans people’s rights not just among activists, but also among trans people more generally. It also contains information on how rights can be claimed if they have been violated. The guide can be unfolded into a poster, providing an easy way to reach more trans people at events or in public spaces. 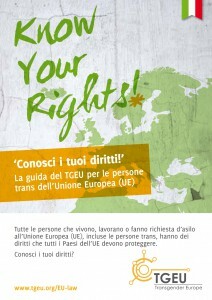 TGEU’s “Know your Rights!” Guide for Trans People in the EU have been translated into Italian and Polish. This pocket guide contains information on how rights can be claimed if they have been violated. Click on the images to download the guides. To order copies of the guides, please fill in the order form. We especially appreciate orders from groups or organisations that are willing to distribute the guides in their national or regional context. For more information and resources on EU law and trans people’s rights in the EU, check our EU law resources page. These publications have been produced with financial support from the Open Society Foundations, the Dutch Government and the Rights, Equality and Citizenship Programme of the European Union. 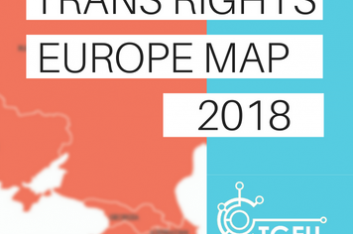 The contents of this publication are the sole responsibility of Transgender Europe, and can in no way be taken to reflect the views of the European Commission, the Open Society Foundations or the Dutch Government.